Do you want to celebrate your holiday with us? We rent the spacious ground floor of the house: a living room with adjoining playroom, 2 bedrooms, a dining kitchen and a bathroom. There are 4 beds for adults, 1 cot and 1 travelbed. Everything you need when you are on holiday with young children is already available: baby chair, changing table, baby bath, cutlery, stool, toys etc. During your vacation you have the house for yourself. There is 1300 m² of enclosed private land, so a lovely space for sunbathing or for the children to play. There is a garden set, a barbeque, a trampoline and outdoor toys. Even if it's not garden weather, you do not have to be bored. In the living room and playroom there are games, books and lots of DVDs and there is Wifi. 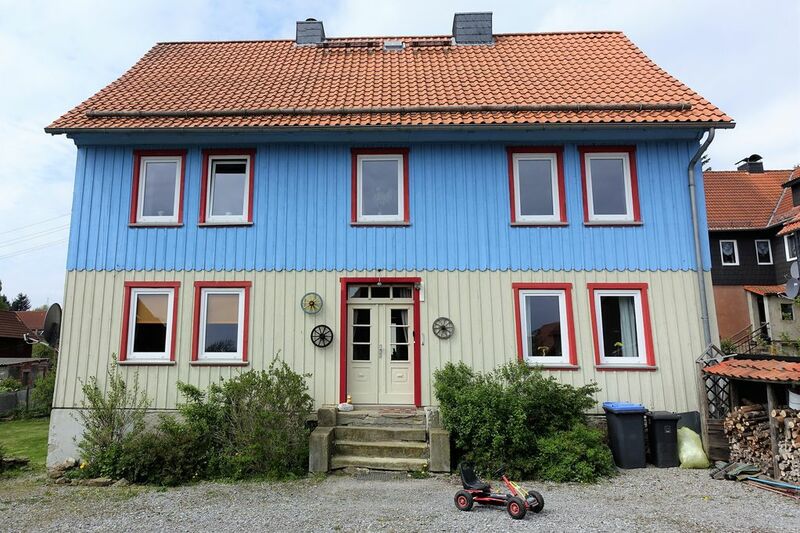 Asgard house is situated high in the village of Hüttenrode surrounded by beautiful nature. You have a spacious view in a wonderfully peaceful area. Just around the corner is a playground. After driving 10 minutes by car you reach the city of Blankenburg with a number of large supermarkets and all kinds of shops. Hüttenrode lies in the middle of the Harz and many nice destinations can be reached within an hour. There are many leaflets in the house with ideas for trips. Nature lovers can also enjoy themselves in this beautiful nature reserve. The forest is a 5-minute walk from our holiday home. On the day of arrival you can enter the house from 15 o'clock. The key is available in a keysafe and you pay our German neighbor the deposit. She can be reached throughout your stay if you have any questions or if there are unexpected problems with the house. We can be reached by phone if necessary. On the day of departure we ask you to leave the house before 10 am and return the key to the neighbor. Asgard House was built around 1890. On a foundation of natural stone, this half-timbered house is made of wooden beams that are connected with pen and hole joints. The spaces thus created between the beams, the boxes, were filled with a mixture of loam and straw. Thereafter a rachelwork is applied with boards attached to them. This gives a good indoor climate. The house has recently been completely renovated and modernized with central heating and double glazing. The name Asgard comes from Norwegian mythology and is the place where gods and goddesses live. According to Norwegian mythology, Asgard would be built by Odin and his brothers Vili and Vé. In doing so they received the help of a number of Thursen. These are fire giants. The house is used as a venue for the German television series 'Alles Klara'. The episodes can still be viewed on YouTube. After enjoying the Harz several years during our holidays with our own children, we, Arijan and Judith realized our dream and bought our own holiday home. We want to share our dream and make it possible for others to enjoy the Harz. We used our experience with holidays with young children to create a holiday home which is fully equipped for a holiday with young children. We look forward to welcoming you in our house! Parking for 2 cars on the street and if desired in the courtyard. There is also cutlery and tableware for children: baby spoons, baby cutlery, spout cups and plastic cups, bowls and plates. There is a highchair available for babies and toddlers and a raised seat for toddlers. There is a stereo with radio and CD player. There are a few books (in Dutch) available. For our young guests, toys, games, puzzles, coloring and craft materials and booklets are available in the playroom. In the hall outdoor toys are available. There is a whole collection of DVDs for adults and children in Dutch, English and German. The Kurtaxe (local tax) is €2,50 per adult per night and €1,25 per child per night for children aged 6 to 17. After booking the total amount of Kurtaxe will be calculated based on the ages of the children. Any difference between the amount of Kurtaxe already charged and the calculated amount will be settled accordingly. Upon arrival in our holiday rental you will receive a ‘Blankenburger Urlaubsticket’, a booklet with tickets, as proof of payment of the Kurtaxe as well as a mandatory registration form. The “Blankenburger Urlaubsticket” grants your free access to public transportation through the ‘Harzer Urlaubs-Ticket’ (HATIX in short). Furthermore you will receive several coupons for discounts at restaurants, recreational facilities and museums in and around Blankenburg. The ‘Blankenburger Urlaubsticket’ also serves as ‘Harz-Gastkarte’, that you can use in around 50 locations throughout the Harz region to use for special offers or recreational facilities for free or at a discount. We very much enjoyed our stay in Huettenrode. The house was very comfortable and attractively furnished. The location is convenient with lots of places to visit within easy reach. nette Begrüßung, es war alles da und sehr sauber. Wir haben uns sehr wohlgefühlt und können es nur weiterempfehlen. Ein wirklich schönes Haus, mit Seele und einem großzügigen Grundstück. Sicher wäre es noch gemütlicher, wenn das eine oder andere saniert wird. Vor allem der Boden in Küche und Flur ist renovierungsbedürftig. Insgesamt waren wir zufrieden und haben uns wohl gefühlt. Die Kinder haben sich über die umfangreiche Ausstattung im Spielzimmer gefreut. Die ruhige Lage ist sehr idyllisch. Danke an Kerstin, die uns nett begrüßt und verabschiedet hat. Wir hatten eine tolle Woche dort verbracht, die Einrichtung ist liebevoll und total gemütlich. Unsere Tochter (4) war total begeistert vom Spielzimmer und Trampolin/ Schaukeln im großen Garten. Sämtliche Ausflugsziele waren super erreichbar, die Lage war perfekt. - Sogar in der Küche gab es ein paar Basics, ich errinne mich an Öl und Kaffee, die klar mit Anbruch/Öffnungs-Termin gekennzeichnet waren: Spitze! Bettwäsche mitbringen war etwas lästig, es wurde aber zuvor extra drauf hingewiesen. Der Ort ist perfekt geeignet, um alle möglichen Sehenswürdigkeiten des Harzes innerhalb weniger Minuten (1/4 bis 1/2 Stunde) zu erreichen. Danke für Ihre Bewertung. Wir freuen uns dass die Wohnung Ihnen so gut gefallen hat! Sehr empfehlenswert für Familien...super Ausstattung...vor allem für Kinder!!! Sehr Familienfreundlich und super Ausgangspunkt für Ausflüge! > Walking: beautiful nature. The Harz is almost completely signposted. > Stalactite caves: In the Hermanhöhle live a very rare type of animal called Olms. > Mountain Biking, Tour Bikes: You can bike through the Harz. > Golf: beautiful 18 hole courses at Meisdorf and Bad Harzberg. > Play: fun playground in the street behind the house and there is an Eldorado in Thale with a Toboggan run, trampolines, climbing route through trees, rocky boats etc. > Cross-country skiing: Several places in the Harz are trails eg Friedrichsbrunn. - Der Mietpreis beinhaltet Wlan, Strom, Wasser und Gas. - Max. Belegung: 4 Personen und ein Baby bis 2 Jahre. Ein zusätzliches Baby ist gegen einen Mehrpreis von 10 Euro pro Nacht möglich.